But everywhere I looked, itsy-bitsy cricket frogs were jumping about the trail, and these lovelies were hiding in the vegetation and waters. 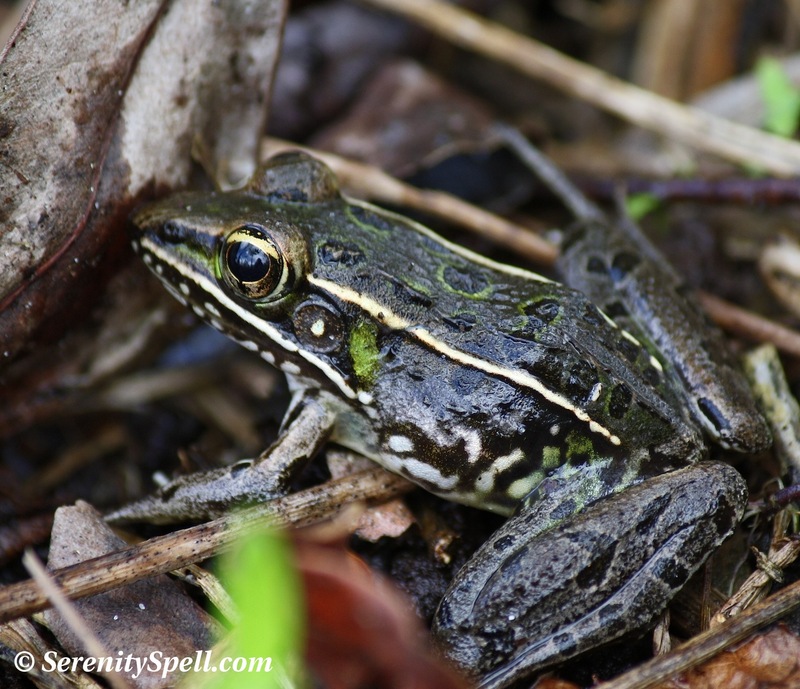 He’s a Southern Leopard Frog (Rana sphenocephala), common to the marshes, swamps, and cypress swamps of our area. The frogs range from dark brown to bright green. 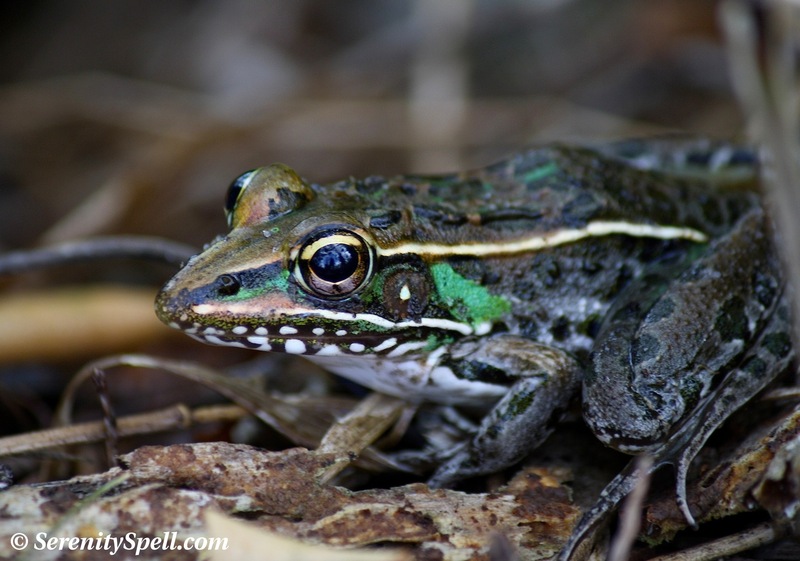 Apparently, the existence of a subspecies — the Florida Leopard Frog (Rana utricularia sphenocephala) — is debated among the experts. Their colors are pure brilliance, with luminescent greens flashing here and there. There were so many frogs I wanted to photograph, but it was tricky nabbing them as they leapt into the waters or darted into the undergrowth. Just magical. 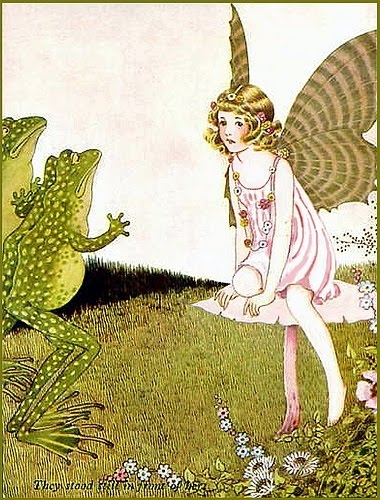 So naturally I had to include one of my favorite children’s illustrators — Ida Rentoul Outhwaite — and her more famous images of frogs and fairies. Nature’s colors, intensity, and variations continue to amaze — may your weekend be equally as spectacular and magical as this brilliant but diminutive frog! I’d love to cross paths with these little ones! Such remarkable photographs you took!! Interesting, educational commentary, too! Thanks for sharing!!! Gives the word “sloe-eyed” a whole new meaning. Awesome pictures! You are quick on the draw! I love children’s books involved with animals, we in Sweden have Elsa Beskow , one fanatastic animal-man lover! Your area has some AMAZING illustrators featuring children and animals… from centuries past to now! Conservationists and artists alike, I’m so jealous! Those are very pretty little fellows! Isn’t he adorable? I had never seen one, on any of our hikes — probably just chance, or lack of waters (we usually try to hike in the winter down here, which means less swampy waters). I love his colors! It’s amazing the sounds that can come out of the tiniest frogs… We have bullfrogs, and the NOISE! Wow. But the pig frogs sound JUST like grunting gators, and you have to pause to really get your bearings — because like you said, you can never see either one! Tricky little things! I just realized I have a rare picture of a pig frog (well, for me — I never actually SEE them!). I’ll post this sneaky, bellowing little fellow soon! The picture(s) following the two frog photographs came as a surprise, but a good one. 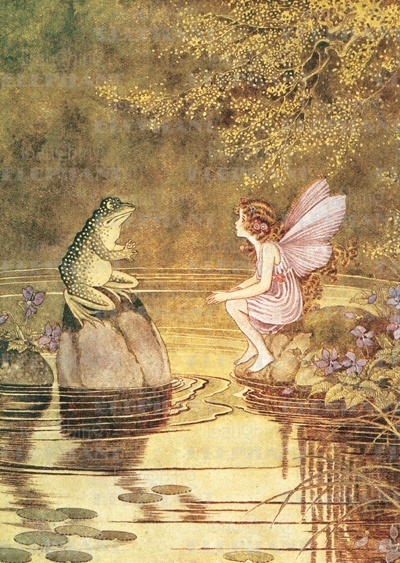 Now if you just had a photograph rather than an illustration of the fairy …. That’s some ear, isn’t it? It’s the little touches that count. Great post! I can never get enough frogs! I think it is totally amazing how in nature creatures are endowed with such lovely flourescent, luminescent coloring whether insect wings, fireflies, sea creatures in phosphorescent bay, fish or humble frogs!! This one already looks like a prince!! Hardly seems fair we have to use body paint of some sort to glow in the dark!! Nice photos. I also LOVE the fairytale pictures in this post. Always so nice how you tie facts together with fantasy. AAAAAAAAAAAAnd the pictures – as aways – way above standard greatness..
Another lovely frog. I haven’t seen any frogs since I was a child, sadly. I have heard them croking in a few marshy places, but I’ve not seen any.